"Romeo and Juliet" was selected in part because it's part of the Common Core curriculum. The program launched at Weld Central High School in April 2015. Contemporary costumes help make Shakespeare accessible. Back in the 1950s in New York City's Central Park, director Joseph Papp hatched an idea to make Shakespeare accessible to the general public. It worked. Theater companies across the globe have adapted Papp's Shakespeare in the Park to fit their needs, and the concept now encompasses any al fresco performance of the Bard's work -- including parking lot productions. We know, we know: A tract of asphalt doesn't sound like a picturesque place for experiencing Shakespeare. But it's actually a great fit for local schools. Come October, audiences of 150 students will be released from class and seated around a white pickup truck, 50 kids per side. That truck will be the stage for the next 50 minutes, as six young actors from the Denver Center for the Performing Arts perform an abridged version of Romeo and Juliet, directed by DCPA Education Director Allison Watrous. "We use the cab, top and bed of the truck, and backstage is behind the truck," says Watrous. "I'm still trying to figure out how to use the space underneath the truck," she adds. Costuming, like the makeshift stage, is "contemporary," as Watrous puts it: a hoodie and jeans for Romeo, played by John Hauser, a modern dress for Jenna Moll Reyes as Juliet, and backward caps and leather jackets for the other cast members: Jessica Austgen, Napoleon Douglas, Justin Walvoord and Chloe McLeod. From its ensemble, wardrobe and setting to an incredible score by local composer Noah Evan Wilson, everything about the adaptation is youthful, modern and accessible. "We have an amazing student matinee program at the Denver Center, but it fills up, and it's getting harder and harder for schools to come to us," explains Watrous. So DCPA's Education Team took a cue from the burgeoning food truck scene, and decided to puts the organization's high-quality acting on wheels. 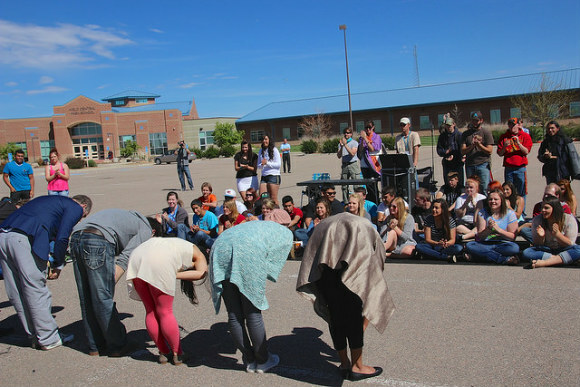 In April 2015, its Anadarko-funded Shakespeare in the Parking Lot piloted at Weld Central High School near Keenesburg, where it served over 400 students in a single day via four performances of Romeo and Juliet. "We launched in full that fall, and did another season last April," says Watrous, noting that in those two months DCPA's Education Team reached nearly 9,100 students in over 20 schools, including East High School in Denver and Gateway High School in Aurora. Anadarko still bankrolls the production, and DCPA was awarded a grant, too, from Rose Community Foundation's Innovate for Good program. "That was instrumental," says Watrous. "What an amazing fund." When it comes to grantmaking, Rose Community Foundation traditionally invests in nonprofit organizations working in the areas of aging, education, health, Jewish life and child and family development. Innovate for Good is an initiative within Rose. "With the Innovate for Good work, we wanted to take out spirit of innovation and reach and engage new people by finding and funding ideas beyond the five issue areas that form the core of our foundation's work," explains Jennifer Moe, director of marketing and public relations. During Innovate for Good's first year, in 2015, the foundation awarded nine grants. "Shakespeare in the Parking Lot was a great fit for a number of reasons," says Moe. "Their idea was inspirational and incredibly innovative." Watrous picked Romeo and Juliet in part because the play is included in the State Board of Education's Common Core State Standards. But it was also ideal for engaging students, too. "One of the things about teaching Shakespeare is that he tells amazing stories about being human," Watrous says. After the curtain(less) call, DCPA actors go into the classroom, where they encourage middle and high school students to examine how elements of the play relate to their lives. "They activate a debate about Juliet's right to privacy," says Watrous. "They talk about how her parents fit in, and whether parents today have a right to, for example, look into a child's phone," she adds. Teenage audiences have responded well to DCPA's new initiative. "When they read the story in class, they don't understand it," Watrous says, offering, "It's meant to be performed. Seeing it live, they suddenly get it." Shakespeare in the Parking Lot will start back up in fall 2016. "We're currently booking schools for the fall and spring seasons," says Watrous. The long-term goal? A DCPA-branded theater truck that takes programming to schools statewide. This story was underwritten by Rose Community Foundation.